A student at University of Texas at Austin, Brooke Fallek video recorded her grandmother, Chaya Fiyzerman Friedman (b. 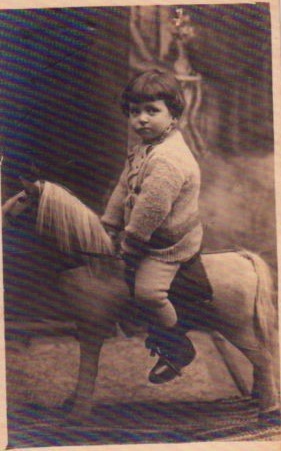 1929, Vilna) in New Jersey, Fall 2014, singing this song about a toy donkey (eyzele) which she learned by sneaking into the Yiddish theater in the Vilna ghetto. Fallek writes about her grandmother – “Her mother hid her in a knapsack at the time of the selection at the closing of the ghetto. They were sent to the Stutthof concentration camp in Latvia. She had to hide in camp since she was a child and should have died A Nazi soldier found her and took a liking to her – he had a daughter her age. Iz Reyzl a meydl, a shtiferke a bren. Hot Reyzl in a fentster an eyzele derzen. Vert Reyzl tsetumlt, zi vil an eyzele vos lakht. Hot papa ir anumlt fun yard aza gebrakht. mit fislekh kurtsinke, oyern lang. Shoklen un viglen zikh af yo un neyn. shloft Reyzl nisht bay nakht. Reyzl, a girl full of mischief and zeal. Suddenly spotted in the window a donkey. So Reyzl gets excited – she wants a laughing donkey. So papa brought her one from the fair. with short legs and big ears. and shakes and rocks to say yes and no. Reyzl can’t sleep at night. Iz Reyzele a meydl, a shtiferke a bren. Hot Reyzele in fentster a hezele derzen. Un Reyzele zi vil nor, a hezele vos lakht. Hot ir der foter fun yarid a hezele gebrakht. mit lange oyerlekh un fislkeh kleyn. Shoklt zikh un vigt zikh – yo, yo un neyn. Men tut a kvetsh a knepele hert zikh a gezang. Oyfn haldz a glekele, klingt es gling, glang, glang. hot fislekh kurtsinke un oyern lang? Zi tsertlt im un tulyet; zi shloft mit im bay nakht. Zi kusht im un zi haldzt im un Reyzele zi lakht. mit lange oyerlekh un fislekh kleyn. Shoklt zikh un vigt zikh yo, yo un neyn. Reyzele is a girl, a scamp, a dynamo. Reyzele saw a rabbit in the window. And Reyzele, she only wants a rabbit that laughs. So her father brought her a rabbit from the fair. with long ears and little legs. Nods and rocks – yes, yes and no. Just push a button and you hear a song. On her throat a little bell that rings -gling, glang, glang. have such short legs and big ears? She caresses it and cradles it; she sleeps with it at night. She kisses it and embraces it and Reyzele, she laughs. The second recording of the song is by Henny Durmashkin on her LP “Lider tsu gedenken” – “Songs to Remember” (thanks to Lorin Sklamberg of the YIVO Sound Archives for sending the mp3 and LP cover with photo of singer and biographical information – click image to enlarge). Her version is very close to Szlanger’s. Durmashkin was also from Vilna; her father Wolf Durmashkin was a Vilna conductor before the war and in the ghetto. Henny’s sister Fanny Durmashkin accompanies her on piano. A film on these remarkable sisters was made in 2007 – “Creating Harmony: the Displaced Persons Orchestra at St. Otillien.” An article from the New Jersey Jewish Standard tells the story. A shortened printed version of the song appears in the Parisian collection, 1948 – “Mir zingen” published by Gezelshaft kinder-fraynt, p. 109. An even shorter recorded version is found in the Ben Stonehill collection. So this song about a rocking toy donkey (or rabbit) is clearly from Vilna/Vilnius, 1930s or perhaps created in the ghetto; but the author and composer are unknown. Fiyzerman sings a verse, or part of a third verse, that the other versions do not include, about the toy being broken. 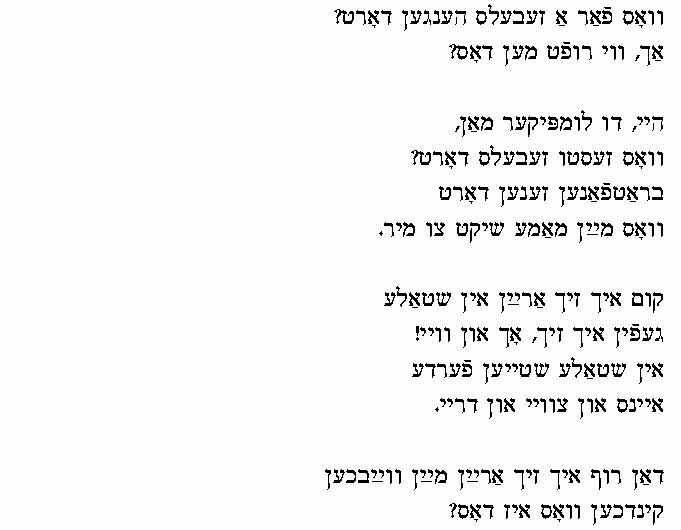 In this week‘s entry the reader will get four Yiddish songs for the price of one. What connects them is the same melody. I am not the first to write on the popularity of this tune. 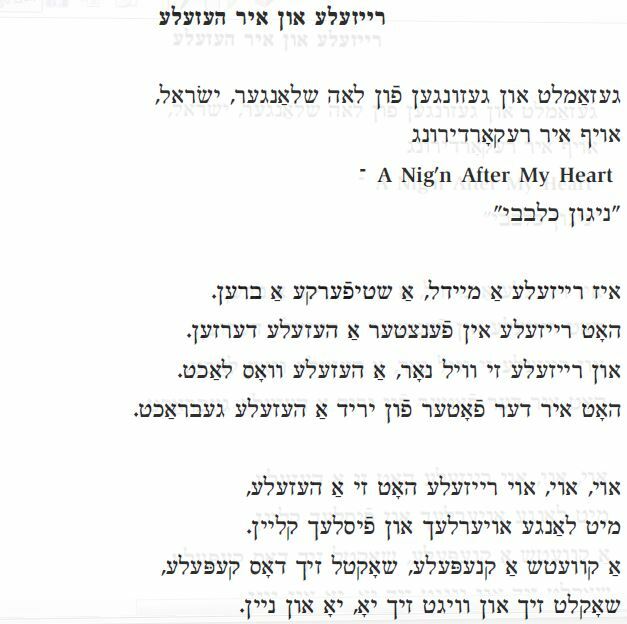 The Israeli Yiddish song-researcher Meir Noy wrote an article זמר סובב עולם [The tune that circles the world] in the Israeli publication אומר, April 13, 1962. I could not find the article yet, so am not sure what he includes. The first song and perhaps the oldest is a beggar song – Vu zenen mayne vugn un ferd? (Where are my wagon and horse? ); the second song Yosele mit Blimele (Yosele and Blimele) is a typical lyrical love song. These are sung by Lifshe Schaechter-Widman (LSW, 1893 – 1974), recorded in 1954 in NYC and originate from her Bukovina repertoire that she learned in the small town of Zvinyetchke in the 1890s-early 1900s. 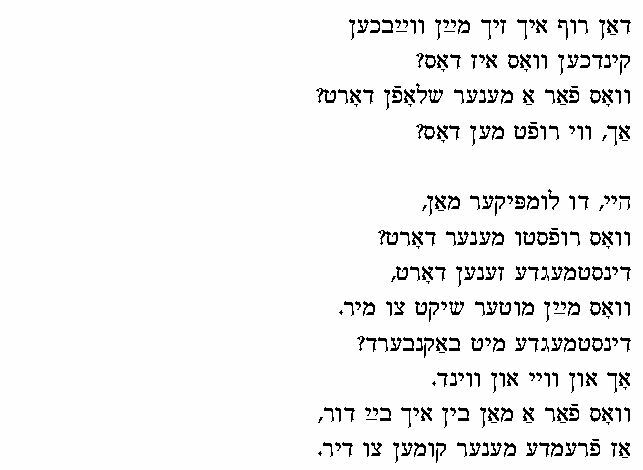 I have found no variants of the beggar song, and one of Yosele mit blimele (Oy vey mame, in the Pipe-Noy collection, see below, page 270-71 with music). The first line as my mother remembers it sung was “Vu iz mayn vugn, vu zenen mayne ferd?” which fits better into the melody; it does indeed sound as if LSW forgot a syllable or two when she sings it here, and forces it into the melody. In the interviews that Professor Barbara Kirshenblatt-Gimblett of New York University recorded with LSW in the early 1970s shortly before her death, LSW said that much of her repertoire, particularly the songs about life‘s difficulties, was learned from the older, married women in town, while the younger unmarried women taught her the hopeful love songs. Vu zenen mayne vugn un ferd would fall into the category taught by the married women (vayber) while Yosele mit blimele would be a typical song performed during the Sabbath afternoon walks that the unmarried girls took into the woods. In terms of style, the beggar song is sung slower and more mournful, while the love song is more playful. zolst im gebn a vink, azoy vi ikh tsu dir. Zolst im gebn a tuler in der hant. you should give him a wink, like I give to you. so he will know what embarrased you. A verse which implies an abortion! But in such a light-hearted song it seems quite incongruous. 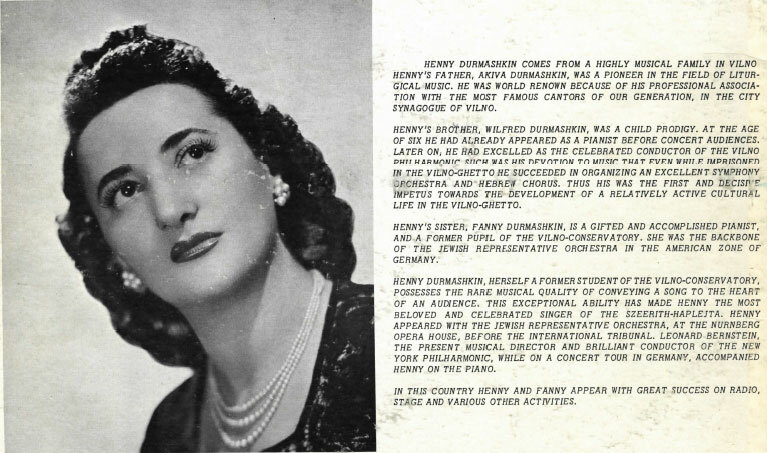 The third song – In a kleynem shtibele (In a Small Room) – is sung by Beyle Schaechter-Gottesman (born 1920) and was recorded May 13th 2011 (last week) in the Bronx. 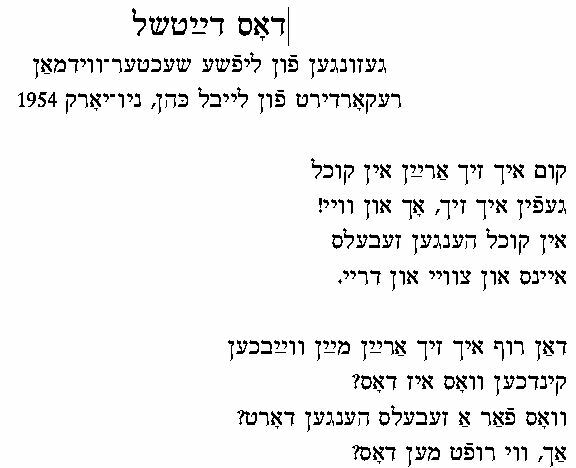 She learned this song in one of her afternoon Yiddish classes in Chernovitz, (then Romania) either at the Morgnroit school (Socialist Bundist) or the Yidisher shulfareyn, a Yiddish cultural group, in the 1920s, early 1930s. Basically the same version was collected by the folklorists Shmuel-Zanvil Pipe and his brother Oyzer Pipe in their hometown of Sanok (in yiddish- Sunik), Galicia, then Poland. 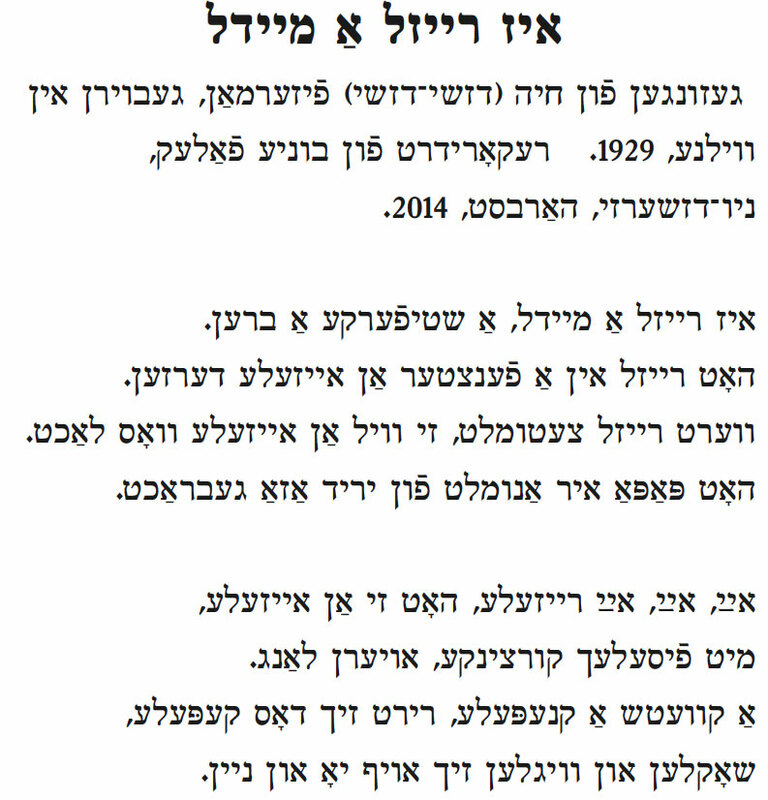 Dov and Meir Noy published the Pipe brothers collection in Israel (Folklore Research Studies , Vol. 2, Jerusalem 1971), and a copy of that version is attached with the music. 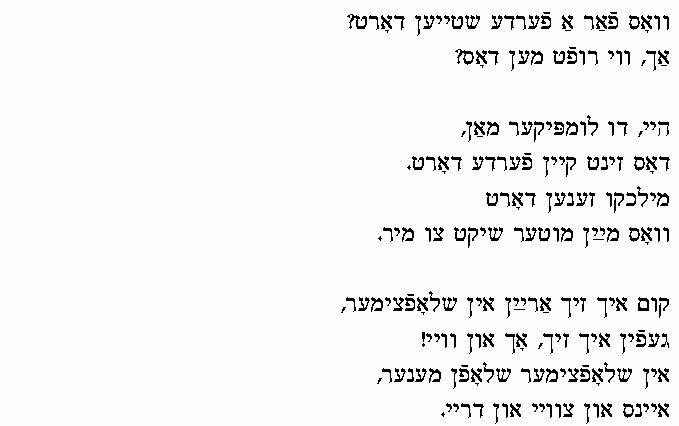 See the footnote to the song by Dov and Meir Noy (p. 326) for other songs with this melody, and the reference to Meir Noy‘s article mentioned above. In a kleynem shtibele is a worker‘s song, text written by the writer and ethnographer A. Litvin (pseudonym of Shmuel Hurvits 1863 – 1943) and the complete original text (Di neyterkes) can be found in M. Bassin‘s Antologye: Finf hundert yor yidishe poezye, volume one 258-259, NY 1917. The fourth song with the same melody is In shtetl Nikolayev (In the Town of Nikolayev). The Freedman Jewish Sound Archive has information on three recordings: a version by David Medoff (1923); Kapelye (the album „Future and Past‟, sung by Michael Alpert); and the German group Aufwind (from the album „Awek di junge jorn‟). We have included a link to the Medoff performance. See Mark Slobin and Richard Spotwood‘s article on Medoff (David Medoff: A Case Study in Interethnic Popular Culture in American Music, Vol. 3, No. 3 (Autumn, 1985), pp. 261-276. Song 1: Vu zenen mayne vugn un ferd? (Where are my wagon and horse?). Performance by Lifshe Schaechter-Widman, recorded in 1954 by Leybl Kahn. Song 2: Yosele mit Blimele (Yosele and Blimele). Performance by Lifshe Schaechter-Widman, recorded in 1954 by Leybl Kahn. 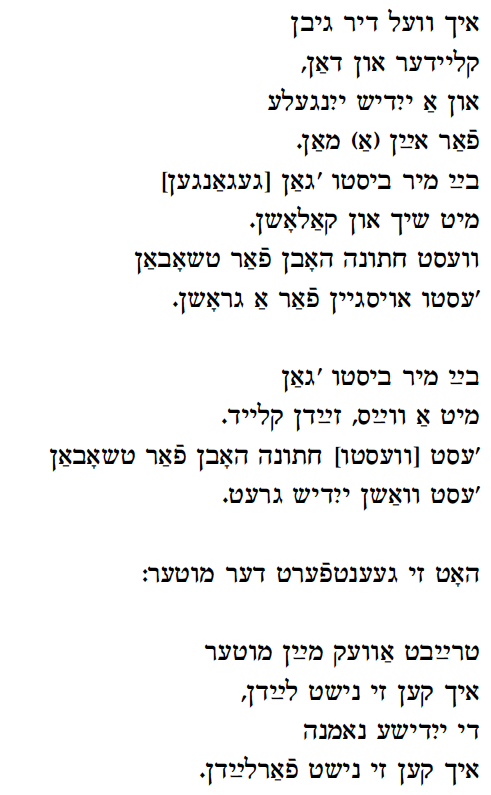 Song 3: In a kleynem shtibele (In a Small Room). Performance by Beyle Schaechter-Gottesman, recorded May 12, 2011 by Itzik Gottesman. Song 4: In shtetl Nikolayev (In the Town of Nikolayev). Performance by David Medoff, recorded 1923. Vu zenen mayne vugn un ferd? Az ikh bin aroysgefurn, hot getsitert himl un erd. Hant bin ikh urem; shtey ikh ba der tir. Kimen tsu geyn di sholtikes un lakhn (up?) fin mir. Where are my wagon and horse? When I first drove out, heaven and earth shook. Now that I am poor, I stand at the door. So the scoundrels come by to mock me. Vi iz mayn tsiring vus ikh hob gebrakht fin vin? Vus mayn vab un kinder zenen gegongen ongetin? Hant az ikh bin urem, shtey ikh far der tir. Kimen tsu geyn di sholtikes un lakhn up (?) fin mir. Where is the jewelry that I had brought from Vienna? That was worn by my wife and children. Now that I am poor, I stand by the door. Yosele mit Blimele zey zitsn af a bank. Oy vey Blimele, ikh bin azoy krank. Der dokter hot mir geheysn khasene-hobn. Yosele and Blimele are sitting on a bench. Oh dear Blimele, I am so very ill. The doctor ordered me to get married. Khasene hobn – es geyt dir nor in deym. Khasene hobn – ken men glaykh ven (?) me vil aleyn. Khasene hobn – darf men hubn gelt. Ken men opfirn a sheyne velt. Getting married – is all you can think of. Getting married is easy if you want to do by ourselves. and then you can have a beautiful world. Yingelekh un meydelekh hot shoyn nisht keyn moyre. Khasene hubn – es shteyt dokh in der toyre. un az der rebe vil a vab, meygn mir avode. Boys and girls, you no longer have to fear. 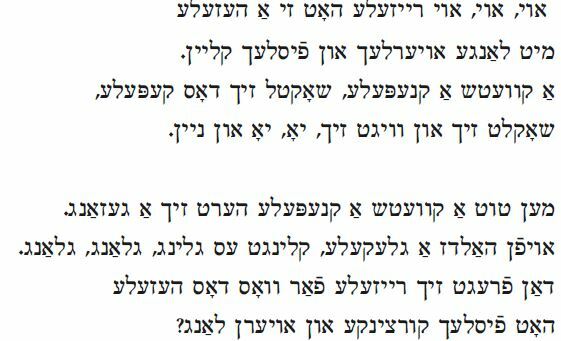 Getting married – It says so in the Torah. and if the Rebbe wants a wife, then we may too of course. In a kleynem shtibele, bay a langn tish. Zitsn dortn meydelekh un dreyen mit di fis. Un azoy vern tutsnvayz hemdelekh gemakht. There sit girls and turn with their feet. They turn the machines from early to night. And thus by the dozens, shirts are produced. Girls, so small, tell me why are you pale? Meydelekh ir kleninke, zogt vos zent ir blas? Hemdelekh ir vaysinke, zogt vos zent ir nas? Meydelekh un hemdelekh, zey reydn nisht keyn vort. Nor di mashindelekh zey geyen imer fort. Shirts so white, tell me why are you wet? Girls and shirts, they do not speak a word. But the machines, they keep going forever. 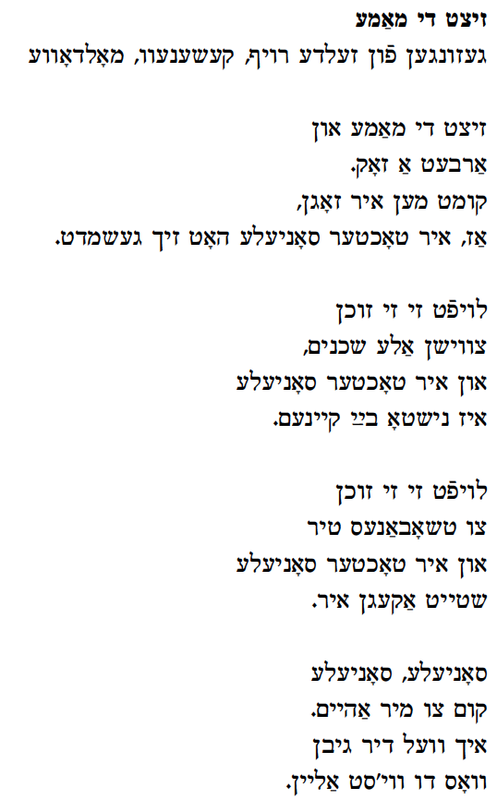 Transliterated lyrics courtesy of the German klezmer band Aufwind may be found on the Zemerl website by clicking here.